This is part of the series that started with Doves 101. In this post we share the truths and myths of bunny rescue. 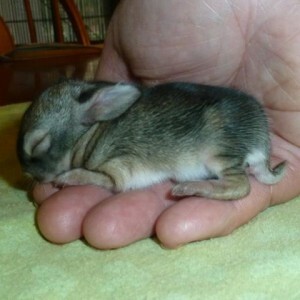 Contrary to popular belief, touching a baby bunny will not make the parents reject it. Stress usually will drive the mother off when curious people poke around the nest site too often. If you find a nest of baby cottontails, do not kidnap them just because you don’t see the mother around. The mother cottontail only comes to the nest twice a day to feed the babies (early in the morning and again at disk). If you want to find out if the mother is still coming to the nest site, place two crossed strings over the nest, then return later to see if the stings were disturbed. If the strings remain in tact, then the mother has not returned and the babies should be rescued. There are two types of wild rabbit in the Phoenix area: jackrabbits (which are actually hares) and cottontails. Jackrabbits are born with their eyes open, fully furred and able to run. Cottontails are born naked, blind and helpless. Never force food or water down a bunny or squirrel’s throat, especially if the animal is cold or dehydrated. It is easy to aspirate an animal if fluid gets into the lungs. The wrong food can cause bloating, illness and death. Never use sugar or Karo syrup which can cause bacterial growth. An experienced rehabber will provide the animal with specialized food and fluids based on the species and requirements. Never feed any small wild mammal cow’s milk! or human baby formula! Each Spring East Valley Wildlife has a special program, called Get Stuffed! We encourage people to fill their Easter baskets with stuffed toys…not with live animals. That baby bunny that is so cute in the pet store will require many years of proper diet, vet care and housing. It is not a toy and can never be released into the wild. Releasing a tame pet is a death sentence to the animal. The et bunny does not have the skills to survive on its own and will not be accepted by wild animals of its own species. If you find an injured bunny contact East Valley Wildlife. We have knowledgeable volunteers who can help. Check out our website for more information about bunnies and squirrel rescue.